When you create a new analysis, it does not contain any Symptoms or Rubrics. But in many situations, you are likely to use similar Symptoms for similar cases. 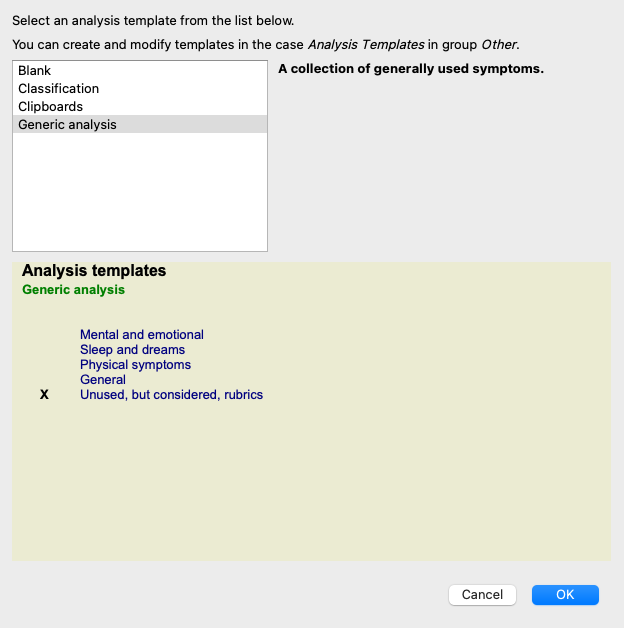 To make this easier, you can create analysis templates. An analysis template is a starting point for a new analysis, already containing a number of predefined elements. These can be Symptoms, as well as often used repertory Rubrics. To create a new analysis, you must first create a new case, or open an already existing case. See Creating a case file and Opening a case file. You create a new analysis from a template. (Menu option Case / Add analysis from template, control-T). When you select a template, an example of its contents is shown in the lower half of the screen. Creating your own templates is very easy. All templates are stored in a special case file, called Analysis templates. You can find it in the cases group Other, alongside the Demo case - Andrew case file. In this case file, you can create new analyses just like you create normal analyses in other case files. The notes you add to this analysis are used as the description of the template. Just open the Analysis templates case file, and you will quickly see how it works! If you already have an analysis somewhere in a case file and you want to use that as a new template, just duplicate that analysis and then transfer it to the Analysis templates case file. (Menu option Case / Duplicate analysis, control-D, menu option Case / Move analysis to case...). You can share your analysis templates with your colleagues just like you share other analyses. For details, see section Case sharing. Export files can easily be shared on internet too!